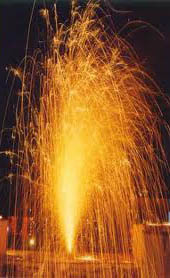 Diwali is a major Indian festival that is very significant in Hinduism. The word "Diwali" is the corruption of the Sanskrit word "Deepavali", Deepa meaning light and Avali meaning a row. It means a row of lights and indeed illumination forms its main attraction. It is celebrated on a nation-wide scale on Amavasya - the 15th day of the dark fortnight of the Hindu month of Ashwin (Aasho) (October / November) every year. It comes exactly twenty days after Dussehra. Hindus and Sikhs alike regard it as a celebration of life and use the occasion to strengthen family and social relationships. It symbolizes the victory of good over evil, and lamps are lit as a sign of celebration and hope for humankind. Celebrations focus on lights and lamps, particularly traditional dipa or diya. Every home is lit with the orange glow of twinkling diyas to welcome Lakshmi, Goddess of wealth and prosperity. Multi-colored Rangoli designs; floral decorations and fireworks lend grandeur to this festival which heralds joy, mirth and happiness in the ensuring year. On the day of Diwali, many wear new clothes, share sweets and snacks. It is one of the most important festival, and beginning of the year in some Hindu calendars. Diwali is very enthusiastically celebrated for five continuous days and each day has its significance with a number of myths, legends and beliefs. The First day is called DHANTERAS or DHANTRAYODASHI which falls on the thirteenth day of the month of Ashwin. The word "Dhan" means wealth. Entrances to the homes are made colorful with lovely traditional motifs of Rangoli designs to welcome the Goddess of wealth and prosperity. Believing this day to be auspicious, women purchase some gold or silver or at least one or two new utensils. The SECOND day is called NARKA-CHATURDASHI or CHOTI DIWALI which falls on the fourteenth day of the month of Ashwin. This day is dedicated to lights and prayers heralding a future full of joy and laughter. The FOURTH day is PADWA or VARSHAPRATIPADA which marks the coronation of King Vikramaditya and Vikaram-Samvat was started from this Padwa day. Govardhan-Puja is also performed in the North on this day. The FIFTH and final day of Diwali Festival is known by the name of "BHAIYA-DUJ" in the Hindi-speaking belt "BHAV-BIJ" in the Marathi-speaking communities and in Nepal by the name of "BHAI-TIKA". The celebrating of this day has its own importance in continuing to maintain the love between brothers and sisters for it is the day of food-sharing, gift-giving and reaching out to the inner most depths of the hearts. Diwali on the whole has always been the festival with more social than religious connotations. It is a personal, people-oriented festival when enmities are forgotten; families and friends meet, enjoy and establish a world of closeness. With thy life and devotion. In India, religion is a way of life. It is an integral part of the entire Indian tradition. For the majority of Indians, religion permeates every aspect of life, from common-place daily chores to education and politics. Secular India is home to Hinduism, Islam, Christianity, Buddhism, Jainism, Sikhism and other innumerable religious traditions. Hinduism is the dominant faith, practised by over 80% of the population. Besides Hindus, Muslims are the most prominent religious group and are an integral part of Indian society. In fact India has the second largest population of Muslims in the world after Indonesia.